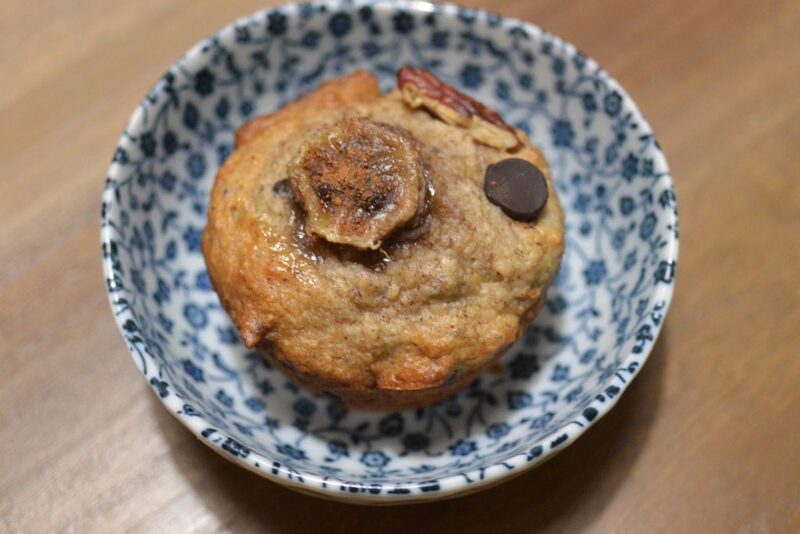 I wasn’t going to post the recipe for my for Banana Pecan Chocolate Chip Muffins but I got such a huge response on my Instagram story that I figured I’d make this my post for this week. So, I realized I had three whole very ripe bananas on my counter. Just staring at me and I needed to get rid of them. Late last year I was a bit obsessed with banana bread. I made all kinds of different versions but once 2017 hit the obsession fizzled away… When contemplating what to make with these bananas. The thought of banana bread made me shrug and literally made me say “MEH”. But the thought of some kind of a muffin enticed me to rummage in my pantry. To find pecans and chocolate chips and BOOM the list of ingredients emerged out of my mind and then a light bulb BING’D over my head…Breakfast Muffins! YUMMY right! 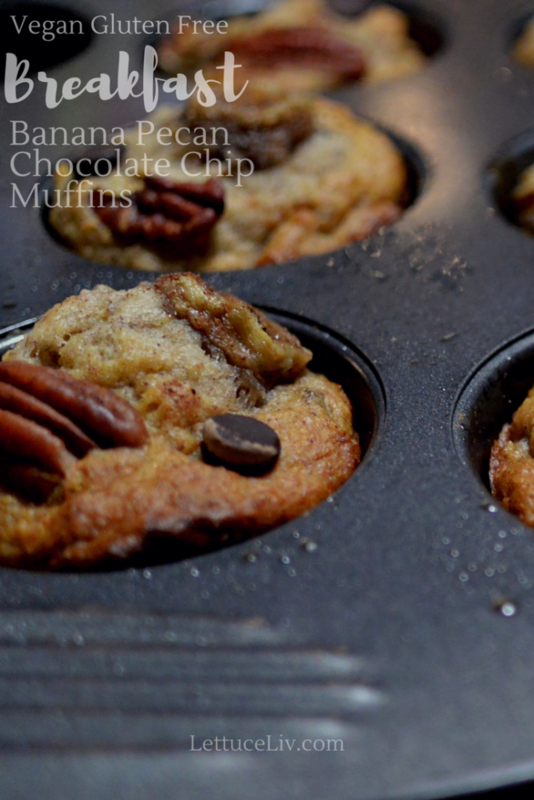 Banana Pecan chocolate chip Muffins! Its perfect for breakfast because its filling, not too sweet and just right to have with your morning coffee. 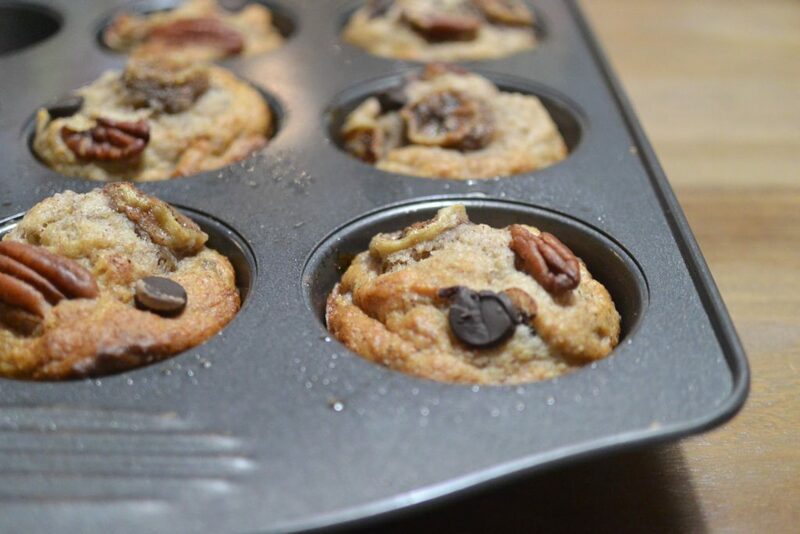 The list of ingredients for Banana Pecan Chocolate Chip Muffins are actually very simple. You will need almond mill, gluten free flour (I use Bob’s red mill) Chia or Flax Egg (basically ground up with water to make an egg like consistency). And 3 bananas, coconut oil, pecans, chocolate chips, maple syrup, cinnamon and baking powder. It’s super easy to assemble, to make the flax or chia egg you will need three teaspoons of ground chia or flax and add 6 teaspoons of water mix together set aside. Add all your dry ingredients in your bowl. Then take all your wet ingredients. Vanilla, oil, maple syrup and add it in to your flax or chia mixtures stir and add all the wet into 2 of the three-mashed banana’s mix well. Finally combined with chopped pecans and chocolate chips. And lastly add all the ingredients together. I found depending on the gluten free flour you use you’ll need to add some extra moisture into your batter, I usually add in small amount of water until I’m satisfied and my dough is to my liking (I don’t want super hard cookie dough or super wet cake batter I like a consistency in between for these muffins). This recipe will make 12 muffins, I like to decorate them with extra slices of banana on top, a whole pecan and a few chocolate chips. 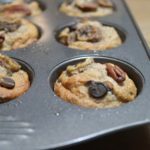 You can enjoy this yummy for Banana Pecan Chocolate Chip Muffins for breakfast with a nice mug of coffee or during your day as a tasty snack! Please let me know what you think and if you would make them in the comments below! Also, if you haven’t checked out my Overnight Chia Seed Pudding yet you can do so here! Looks so delicious! 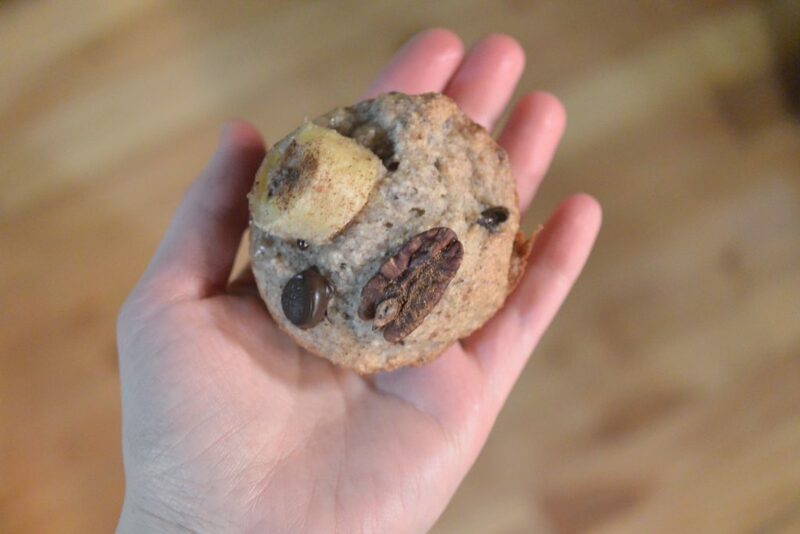 These were my absolute favorite “traditional” muffin, so I will certainly need to try a plant based version. Thank you! These look amazing. I’m definitely going to try this! I can’t wait to try these! They look so yum! 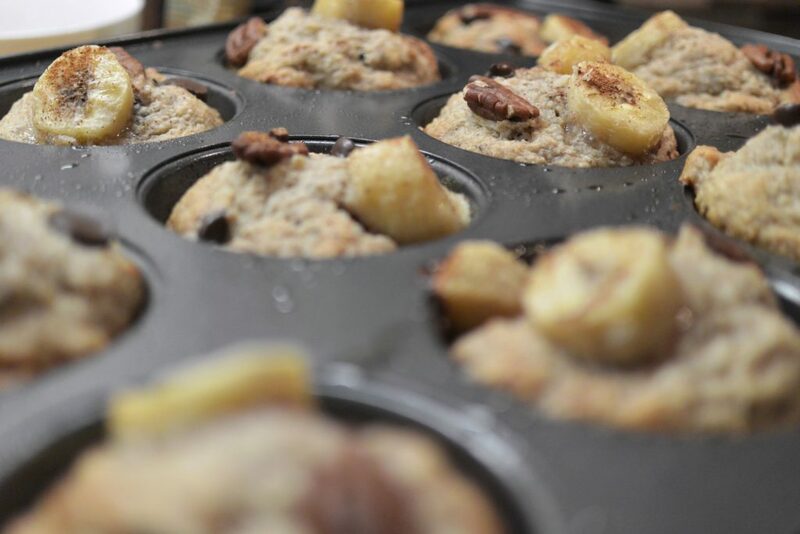 These muffins look great, perfect for a healthy snack or breakfast! These look delicious. I love banana bread, but I’ve never had or tried to make a vegan recipe for it. The recipe is so simple too! They look delicious! I like the idea of using coconut oil in the recipe. I was craving muffins all weekend and didn’t take the time to bake any. Now I am totally inspired. Also I often bake and make gluten free foods here. This one is a recipe I would try!